It's almost Easter and that means time for a patch! 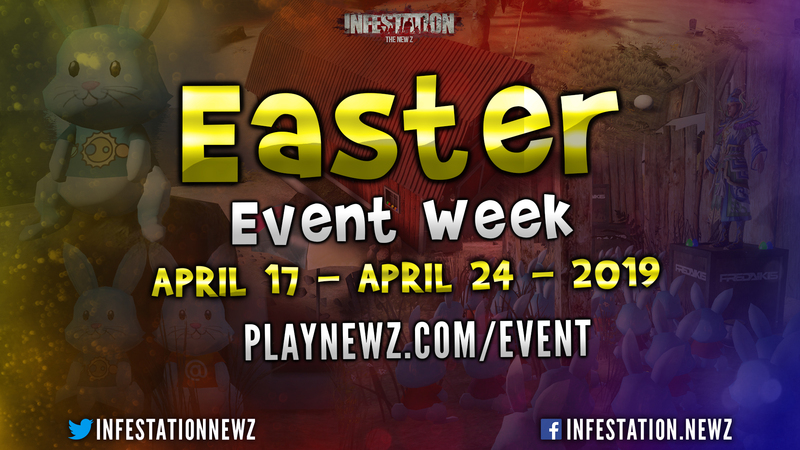 This time we have added a lot of Easter content which is all part of the Easter 2019 event that is starting soon. Next to that we have made some improvements overall and we have done some performance optimizations. Overall a nice patch! Now, let's jump into the patch notes. With Easter upon us, we will be doing a week long event to celebrate this special date! New theme skins (which will be limited) will be brought out! You will be able to hunt for Easter Eggs on the map and also have Easter Egg wars with friends and enemies. There will also be a special character model given to all players during the event to celebrate this Holiday. In addition to all these goodies that you'll be able to find in game, you will also be able to farm and farm and farm as we will also be having Double XP and Double GD during the week. Every map now has Easter 2019 areas which are specially made for the Easter 2019 event. These areas are placed in the maps and will be filled with special loot, zombies and more event related stuff. More information will come soon in a separate Easter 2019 event announcement. Fixed an issue with server passwords and the recent / favorite games list. Fixed an issue where it was not working to hide your missions in the screen with "L" (default). Fixed an issue in the Russian language which was causing crashes. Fixed an issue in the Chinese language which was causing crashes. Fixed the LODs of the office building. These LODs were added the last patch and were causing some issues. Fixed the Convention Center and created LODs for it. Added a bunch of Easter content for the Easter 2019 event. More Information about the Easter 2019 event will come soon. Also added some cosmetics, skins and sprays for the Easter 2019 event. Added a new Riot Shield for the clan called v5k. Added a new Media Riot Shield for the streamer KoolKid Edgar. Added a new Media Riot Shield for the streamer 37Frauen. Added a new Media Riot Shield for the streamer Kill3r. Updated the Custom Guerilla UNIT textures because it looked too similar to another skin set. Updated the Heavy Armor UNIT textures because it looked too similar to another skin set. Updated the MP7 Banana Kong skin. Fixed the materials for all the Infinity skins which were too bright. This was mainly in the Caliwood map. Fixed the skin recipe of the Custom Guerilla Helix and Rapido. The trading lounge is now in Easter style! This for the Easter 2019 event. Updated the shadows on ultra quality settings. Updated terrain settings to improve performance. Updated depth of field settings to improve performance. We are going to update the available maps in the PVP Servers section. The map "Hangar" is going to get removed and the map "West Oaks" is going to be added. We will see how this rotation is received by the community and based on that we can implement further changes & improvements. Contest point B has been moved more towards the defending team's spawn. Added more smaller props and objects around the map to improve gameplay and give more cover for players. Fixed the flying objects in the mechanic buildings. Removed the big truck at contest point B. Players could glitch inside this truck and abuse that. We are going to update the available maps in Survival. Based on a poll and feedback from the community we will change the available official maps. This means that after this patch only Oregon and Colorado V1 will be on the official list. Colorado V2 will still be available but only as private server. Note: Content of the lockers that are placed on the disappearing servers will automatically be moved to the player's global inventories. Fixed the terrain under the bridge. Players were able to glitch inside of the terrain at some places and abuse that. Added a Survival version of Cliffside for upcoming events. More information about this and the release will come soon. Fixed the new open buildings and also added interior props and loot to them. Fixed some flying rocks close to the school. Estimated patch size: around 250 mb. Patch ETA: Around 9-10 AM (CEST) on Tuesday April 16. Estimated downtime: Around 1 hour. We will try to keep the downtime as little as needed. Pre-patch notes might be changed if we need to fix / add something. Once again thank you for your great support! Want to support us even more? Make sure to share these patch notes with your friends and followers! Does it give double GC? Wow great. Thanks for fixing the military spot under the Bridge crossroads at Cali. Have you fixed the missing "D" letter btw? It dissapears at a far range, I mean the large "CALIWOOD" letters set on a mountain. And one more thing. Unfortunately we cannot enjoy the Easter grenades on OpenWorld AR only maps. You have switched them off for the mode. Probably because grenades are not ARs LOL. dear developers thank you for the skins,,however it is necessary to buy elite skins from other players but it only provokes players to invest in the game !!!! I want to share the idea why don't you make skins of zombies or super zombies ???? Why all Colorado v2 servers taken away? Hello! Thank you for returning the optimization,now I can play on high settings again! HAPPY EASTER! The Easter 2019 events have officially started NOW! A new Easter 2019 Easter Egg Basket, Easter skins, sprays, special Easter area's and more are NOW ACTIVE! We also have a free revive weekend coming up and things such as double XP and GD. More PVE in the Events. Sounds good for new player! This is so great! I like this patch and I hope there is more coming good ideas and awesome update! Keep it up!